Significant material and energy savings achieved with flow.control pro and GESS.tronic. Greiner Extrusion increases quality levels and profitability in the profile extrusion industry with its new product innovations recently made available on the market: flow.control pro and GESS.tronic. With flow.control pro substantial savings in the cost of materials are achieved; using GESS.tronic a significant reduction in energy consumption is achieved. Both of these innovative products can be retrofitted to any existing calibration table. Greiner Extrusion additionally offers a free two-week trial period using flow.control pro and GESS.tronic on site at our customers’ production facilities. Nussbach, March 24, 2014 – Greiner Extrusion is placing a key emphasis on reducing the consumption of natural resources – and on energy efficiency. Based on the findings of one of the largest R & D departments in the branch, Greiner Extrusion is focusing on the development in the profile extrusion sector. With these two newest, high-efficiency product innovations – flow.control pro and GESS.tronic – energy use is significantly reduced, and much less material is wasted by achieving a greatly reduced number of rejects. Customers who have already integrated flow.control pro and GESS.tronic as standard in their production lines are enthusiastic about the cost benefits and high level of quality. The flow.control pro system is used to accelerate or decelerate individual profile sections using hot and cold air. Fast, accurate flow correction is applied – without affecting nearby sections. Material variations are compensated for inline, achieving a reduction in the number of rejects. Savings in the cost of materials is achieved due to its providing for production at the lowest possible profile weight limit. Used in combination with GESS.tronic additional synergies are created, increasing the savings potential. With these innovations, profile extrusion has been raised to a new level in terms of profitability and quality. 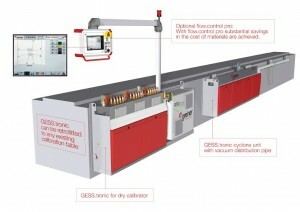 The GESS.tronic system achieves up to an 80% reduction in energy consumption. Vacuum pumps for the dry calibrators are controlled by connected frequency transformers. A stable vacuum level in the dry calibrators and PDC tank is achieved through maintaining a constant water level in the manifold, and the strict separation of water and air. GESS.tronic has already been made standard for RED.LINE calibrating tables – and it can easily be retrofitted with existing calibration tables. Greiner Extrusion is a subsidiary of Greiner Tool.Tec, and an integral part of Greiner Group. During the past 30 years, consistency and innovative thinking have made Greiner Extrusion the worldwide leader in toolings and machinery for plastic profile extrusion, and in designing complete manufacturing facilities for the production of plastic window profiles. Most major window profile extruders utilize toolings from Greiner Extrusion for their production. Greiner Tool.Tec is based at Nussbach, Upper Austria, and has 11 locations in five countries. In 2012, the company achieved an annual sales volume of € 75 million with a workforce of 783 employees.